The world outside of the classroom offers students and teachers alike many opportunities to take learning from the abstract to real-life. A student garden can teach about nutrition and botany, a streetscape analysis can teach about engineering and business, and a trip to the grocery store can teach you about percentages and effective communication. A public transit system can teach how transportation modes are designed, operated, and contribute to the economic and social development of a community. Many students and teachers, both independently and with the facilitation of Metro, have created lesson plans and adventures that bring the many lessons from public transit to life. 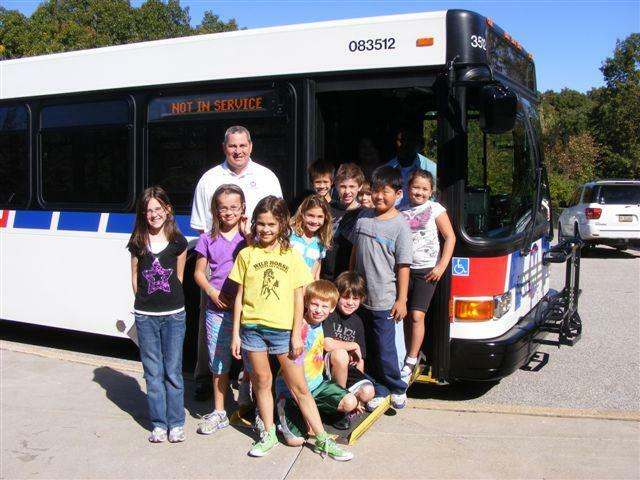 The Center for Creative Learning in the Rockwood School District in Missouri have partnered with Metro for the last several years to teaching their students about how transportation plays an important role in building communities. The Great Transportation Debate gives students the opportunity to advocate for one of four different modes of transportation (automobiles, pedestrian and bikes, community shuttle buses or bus and light rail transit) in front of a student-run city council. The exercise brings together the students’ knowledge and gives them the opportunity to work together, present information, use critical thinking skills and make decisions. The exercise requires a minimum of one hour on debate day and can be incorporated into curriculum to include pre-work and research if time and resources allow. Metro staff are able to travel to schools and work with students and teachers for this exercise. For more information, contact Suzanne Whitehead at swhitehead@metrostlouis.org. Every year, eighth-grade students from St. Cecelia Academy in South St. Louis City embark on a transit adventure that they must plan – and execute – by themselves, without teacher involvement. St. Cecelia faculty and staff accompany the groups of eighth graders to their destinations, but the students are encouraged to learn how to use the system independently. The reason? Many of St. Cecelia’s students go on to Catholic high schools throughout the region, and knowing how to use transit gives them more options for getting to and from school. Click here if you do not see the slideshow. 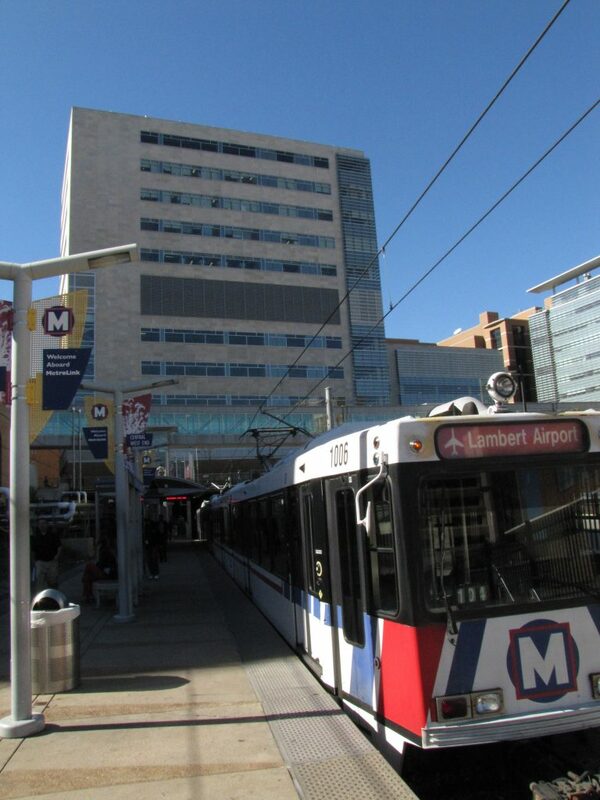 Students can use Google Transit or TripFinder on at www.metrostlouis.org, and plan their own class trip. Students learn how to budget time, read maps, explore the area, and work together as a transit-traveling team. Earlier this month, Nextstop highlighted the class projects of Maplewood-Richmond Heights Middle School students. The students were assigned various MetroLink Stations, and were asked to use video and visual media, poetry, and community understanding to create a series of art projects, including a collaborative collage in the style of Romare Bearden. The MetroLink projects were part of MRH’s Expeditionary Learning curriculum, and one of many opportunities for students to learn outside the classroom. 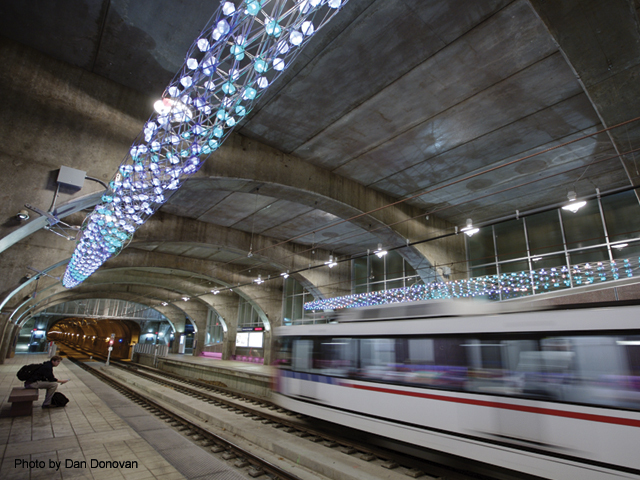 If you ride MetroLink, you will see that example of public art and design everywhere, a function of Metro’s Arts in Transit Program. The program, thanks to a grant from the National Endowment for the Arts, has created a curriculum kit that highlights the public art along the St. Louis transit system, and provides a series of lesson plans and teaching tools to introduce students to arts in transit. Teachers and students can access the St. Louis Public Art Curriculum Kit online (with downloadable posters and lessons plans) or via hard copy by contacting Director of Arts in Transit David Allen at dmallen@metrostlouis.org. In addition to offering school on-site visits, Metro also hosts tours for students and other curious learners. Metro offers tours to groups of the MetroLink Yard and Shops. The tour includes an overview of Metro, a walking tour of a train and the maintenance shop (“train hospital”) where light rail vehicles are inspected and repaired, and a walking tour of OCC (Operations Control Center). OCC is the nerve center for MetroLink and MetroBus. All trains and buses are dispatched and controlled from OCC. This integrated control center minimizes service interruptions for the entire Metro system. OCC also houses the security dispatchers who are watching everything that happens to keep passengers secure when using the transit system. Tours can be customized for different groups, depending on their individual needs. (e.g, High School – transit career choices, grade school – transit and the environment, cub scouts – engineering/construction badge). On-site tours average 90 minutes, and give a great portrait of what it takes to run a transit agency. Tours can be scheduled by submitting a tour request form. Public transit offers a variety of lessons for students of all ages. Whether its engineering careers, physics of motion, community service, transportation planning, public art or travel, Metro has many ways to teach about public transit. If you would like more information, or have ideas, on ways you can connect students to transit, email us at blog@nextstopstl.org.